Updated 11/29. Significant fixes to investigators. 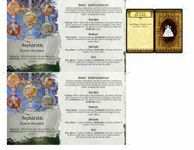 Added new scenarios/campaign play. 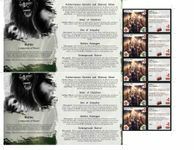 - Added House Rules section, which include my favorite postings from BGG.com. Thanks to Brad Ficek, Bern Harkins for their posts. It seems like the enthusiasm for this game may have died down with the intro of the next title from FFG. We, however, are a little late to the party and still having fun with it. Strange Eons is awesome! 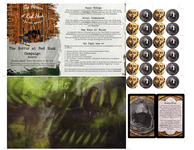 Here is our next attempt at a fan based expansion based on the Horror at Red Hook. Play tested a few times with a few spelling mistakes still to catch. The image files here may be old. I wanted a compact expansion that focused around a single theme, so I used elements from a single story. Much of the text is copied directly from the HPL story. 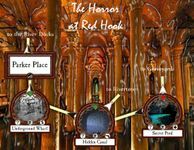 The Red Hook introduces a new neighborhood for the players to explore. Events are triggered in the new location based on existing game mechanics so there is no need to integrate updated materials into the base game. 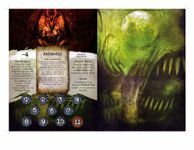 I had two reasons to use the Horror at Red Hook as inspiration – the ancient evil is not based on his standard Mythos so gave an opportunity to introduce a different flavor and the concept of underground evil is pervasive but not built as much of a game mechanic in any of the Arkham Horror expansions. This story, along with the Rats in the Walls, is somewhat inspired by the Neo Pagan notion that ancient fertility cults have remained active from the Roman times into the present. 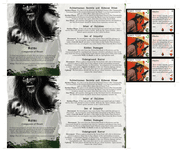 This provides a new set of Ancient Ones with more historical reference materials to draw upon. 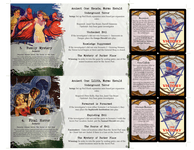 The Herald Card is a great way to introduce atmosphere and new game mechanics. 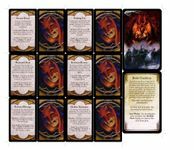 Mormo is a Herald that supports the use of the expansion board and is central to the main invocation that appears through out the story. 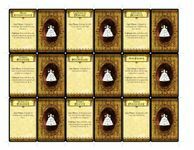 The other Heralds are also part of the story and are used to up the difficulty level significantly. Although Sephiroth is positioned as evil in this story – and is the inspiration for Yog-Sothoth in the Cthulhu mythos (c.f. 10 glowing globes) – this is not accurate. In addition, the use of the name in the Final Fantasy video game may lead some players to mistakely accept this characterization. The use of Sephiroth as an Institution that provides benefit after careful contemplation is a more accurate depiction, even if it is out of synch with the story somewhat. The notion of a Pact with an evil force is also central to this story. I wanted to provide the characters with the option of selecting a “deal with the Devil” in a moment of desperation that then incented them to work harder to finish the game before the negative impact of the decision takes effect. 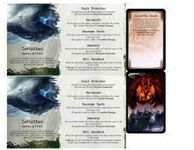 I have seen a number of mechanism for introducing varied types of damage/impacts to players, but the detriment/benefit cards seemed the most elegant to me. It allows for more interesting combat effects from certain monsters. Also Agoraphobia is a key theme in the story. I originally intended to introduce as a madness card, but since it is triggered by a specific event in the story line, the Effect approach seemed to be more elegant. 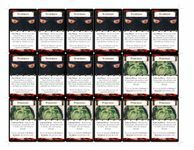 Since player made components never look the same as the game materials, I always seek to avoid mixing them in the same deck. As suggested by Jacob Busby, I have created expansion specific items in a separate item class. This also limits the impact of any potential imbalanced creation on the broader game. One other concept was items that provided further reward, but only after a mini quest to another location, and with the occasional incentive to resolve using the Curse mechanism. I wanted to incorporate the notion of a hidden or underground location that needed to be discovered. I also thought the idea of “one way” passages with potential danger would make the board locations more interesting. 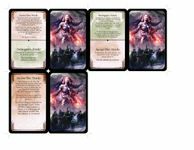 Smaller supplemental boards provide a pleasant add on rather than a full featured expansion but are still able to capture a theme and require less effort to create and find the appropriate balance. Forgot the investigators. 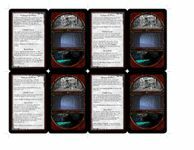 Personal stories are in the .eon files. As is the most recent version of the rules. EDIT: Note these investigators were fixed in 1.3 and new images posted below. Very nice job, to bad FFG wouldn't pick them up and pay you for them the really do look excellent and go along with the current art style found in the game. Very nicely done. Even at the largest option, the text is extremely hard to make out. Is there a way to make it clearer for those who would like to download your expansion? A question and an observation. Han has no random possessions. Is that because of his 6/6 Sanity/Stamina? Peter Kelly has a fix possession of a .38 revolver. The picture depicts his being armed with a .45. That's just for continuity, not that he can't pick up a .45 somewhere along the line. Thank you for the feedback. With regards to Han, you are correct, in order to get a balanced character using Strange Eons, I sacrificed possessions for stats. Thematically the idea was to have a relatively strong character arrive in a new land with very limited possessions. I debated giving him one unique item instead of two clues as a starting point, but clues seemed more appropriate since he has a better grasp than many of what it happening. The starting cash gives him the chance to aquire items if he desires. Good catch regarding the gun. I am not a big gun person (being Canadian) so I missed that. I will update in v1.1. I can create PDFs or JPEGs for the print files and add to dropbox. I have not being doing that for fear of running out of space. I may have assumed incorrectly that most people have access to Strange Eons and print from there. Do most people prefer PDF to .eon? I am currently traveling but will send you a file with better images when I get back this weekend. EDIT: After play testing, Han's lack of skills/starting items turned out to be a little boring so he was updated. There is now a PDF folder at the drop box link, which has all the image files in hi def printable format. I also added the box images. PS Your box image says "A Fam made expansion"... does it mean its rated for family? Hastur has cursed both my fingers and my eyes. I can neither spell nor proof read! Thank you for the catch. 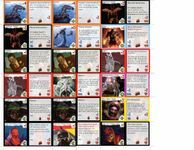 I have updates for all three expansions that I have published which include a number of spelling and grammar corrections. I will post updates in a couple of weeks. I have uploaded a couple of items that missed that first version - an new ancient one and a new herald. 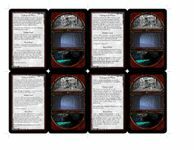 Many players want more of a story line so I tried to introduce a mini quest element with the Hellish Plot cards. Essentially these are little vignettes associated with the doom track progression. 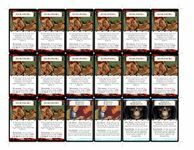 By mixing the easy (Red) and the hard (Black) cards, you can control the pace a little more. Just noticed that your Unique Item "Tasks" should be Missions. Tasks are Common Items, as shown on the one you've got. edit: Also noticed that the backs on your Allies are the red of the other cards on that same page. Those should probably be the Allied backs. I see by looking again that those cards are Unique Items, Common Items and Allies. You've probably got them with the special back for your expansion. Usually the fan expansions continue with the original backs. Since I haven't looked at the rules, though, it might be that these are supposed to be kept separately. Thanks for the feedback. I believe the rules provide a little more clarity but happy to explain my approach. Thanks for the catch on the item type mismatch between mission and task. With regard to the expansion specific card backs, I find most people can not create items that are indistinguishable from the official content so I decided not to ask them to try. 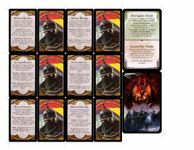 I created items specific to the expansion as their own deck and are brought into play through the encounter cards. 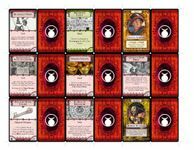 This was a suggestion that I got from BGG that I liked so I have used in all of my expansions. In some expansions, I ask people to draw randomly from the deck and in others I chose the player to pick a specific item based on the encounter (a spawn item?). One is more thematic, the other more re playable. My play testers are divided on which approach is better. Hope that this clarifies the approach. looks also great, thx for sharing! V1.3 is here after several more rounds of play testing. A few big items have changed. 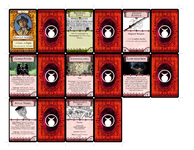 Players loved the Hellish Plots and Ashmodai so we expanded the number of Plot cards. 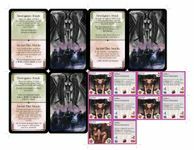 Also stopped plot cards from running out too quickly and wakening the Ancient One. The pace at which events happened on the Mini Board was too slow and we were constantly going back to Mormo card to see which locations opened gates or placed clues on Red Hook. So instead we simplified the effects so that Expansion monsters always appear for any event that takes place in the two impacted neighborhoods (Merchant District and Rivertown) and all the gate openings and clue placement on Red Hook occurs if a clue or gate is prevented in one of these two neighborhoods. The investigators in v1.1 were horrible. After playing them a few more rounds, it became obvious we had taken away too much speed and sneak to provide more fight/will which made for boring characters. In addition, adding an extra point to Stamina or Sanity (which is allowed in the editor) at the expense of starting possessions made for characters that were too one dimensional and lacked replayability. Added new items and new location cards to improve re playability. We did not change the location cards to make the item draws random. We tried playing that way but the mix of the items and location text was inconsistent and players did not like it. 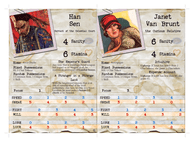 - If the Investigators win the game, the First Player at the time of the game ending should draw an Epilogues Victory card and apply the effects to the surviving Investigators before proceeding to the next Scenario. 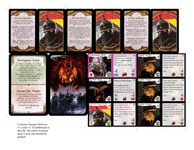 If the Investigators lose the game, the First Player at the time of the game ending should draw an Epilogues Defeat card and apply the effects to the Investigators who participated in the Final Battle before proceeding to the next Scenario. - Investigators that are Devoured prior to the Final Battle in a particular Scenario may not be used in the Scenario that immediately follows (i.e. they must skip one Scenario before being used again). This rule should be ignored if the scenario calls for specific investigators or you do not have enough investigators to proceed. - If an Investigator does not carry forward immediately to the next Scenario, they should be returned to the pool and start as if new in future Scenarios.